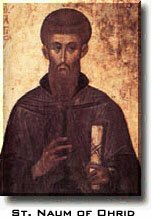 The principle written testimonies to Saint Clement of Ohrid life are his hagiography known as Comprehensive, by Archbishop Theophilact of Ohrid, written at the end of the 11th century, and the Prologue by Demetrius Chomatius an Ohrid archbishop of the 13th century. Both are written in Ecclesiastical Greek. As to the life of Naum, Clement's companion and brother in faith, it is most thoroughly, though still scantly, dealt with in his two Slavonic Hagiographies which remained unknown until the end of the last century. According to the written documents, the faithful disciples of St. Cyril and Methodius, the godly and righteous Clement, Naum, Gorazd, Angelatius and Sava, were of equal learning and maturity as apostles. Methodius had been preparing Gorazd to be his successor, but destiny decided otherwise. Clement and the rest of the exiles, following the Danube via Singinidum (Belgrad) reached Pliska and the court of the Bulgarian Prince Boris-Michael. Having a long wished for his own clerical elite, the latter gave the exhausted newcomers a warm welcome. After a few months Clement was appointed to Ohrid, Devol, Glavenica to preach the gospel and introduce the Slavonic alphabet to the flock there. Naum stayed in the Monastery of Pantelejmon near Preslav teaching the monks and introducing them in the Gospel. Seven years later in 893, after the coronation of Simeon, Clement was summoned to Kutmičevica and to the new capital, Preslav. Simeon - one of the most educated spirits of the time, "a child of the Great School" - immediately summoned a council at which Clement was probably also present. It was expected that Clement would be given the position of the prince's royal counselor and assistant. This, however, did not happen. The reformation of the alphabet and the introduction of the Cyrillic letters, apparently attenuated the relationship between the Ohrid apostle and the prince, who was later to become a Bulgarian Tzar. Clement was appointed to a peripheral province of the state, the Velička bishopric. This appointment somewhat resembles a "reproach", a distancing. The disagreement on the painful issue of the alphabet and Clement's opposition to the new "hellenized" alphabet appear to be the reasons for the alienation between Clement and the Prince Simeon over the cultural policy of the state. The benefits were manifold. The apostolic work continued in Ohrid. Clement was joined by Naum. The Ohrid region became the center of the first Slavonic University - the Ohrid literary school. The alphabet used was the Glagolitic. The tradition of Cyril and Methodius was preserved and continued. Ohrid was thenceforth a spring of new water, a fast-flowing stream which flowed and unchecked though Macedonia and merged, as a constituent part, into the vast sea of Slavonic and Byzantine culture. The role by the founders of the first schooling in the Balkans was immense. Legends speak 3000 students. Theophilact says that Clement preached "...in a few words...about the ecclesiastical life, the memory of the saints, the enlightenment of the soul..." He translated continuously: chants, psalms, festal fragments from the Bible, moralities... Thus Slavonic liturgy was beginning to be created. In their beloved Clement and Naum built their churches on opposite sides of the lake. In the town itself Clement dedicated a shrine to the holy healer Pantelejmon. At the same time, towards the end of the 9th century, by the springs of the Crni Drim river, Naum erected a monument to the archangels of the bodiless army, Gabriel and Michael. Both Clement and Naum were buried in the tombs which they themselves had built in the churches they requested: Naum in the year 910 in the Monastery St. Naum and six years later Clement in 916. The belief that St. Naum in his monastery heals mentally ill and those possessed by demons survives to this very day. A small portion of literature in Glagolitic translation, created in the scriptoriums of the Ohrid Literary School and dispersed throughout the world, such as Evangelarium Assemani (Codex Vaticanus) and the Zograph and the Gospel of Mary and the Sinai Psalter and Prayer Book have been preserved. The manuscripts from Clement's language tradition, with their illuminations, vignettes and initials and their linguistic structure undoubtedly originate tradition of Cyril and Methodius. A comparison of the philological and stylistic features of the translations into Old Church Slavonic or Old Macedonian with the original texts in Ecclesiastical Greek point to the fact that the first translator or translators, begin very well acquainted with the culture of speech, formed a district literary type and a language with its own phraseology, syntax and patterns. In some gospels, for instance, the stylistic and rhythmical qualities of the translation are more effective than those of the original Greek text. The precise expression of the mystical tripartite Christian creative principle (the Holy Trinity), as well as the impeccable literary organization, especially in the manuscripts of the Assemani and Zograph Gospel, show their author as a unifier of the crowing achievements of linguistic values. 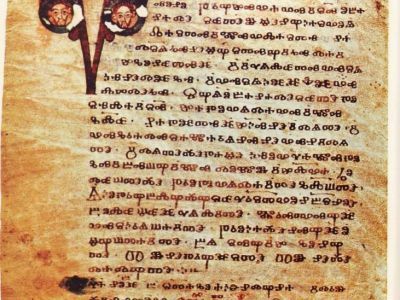 The Zograph four Gospels, named after the Mount Athos (Sveta Gora) monastery to which it belonged - written on 303 parchment sheets - is the most substantial manuscript in the Glagolitic alphabet. Ever since 1376 when Joseph Assemani, an orientalist and librarian, took the Ohrid manuscript - aprakos (or gospel selections), with its 158 parchment sheets, from Jerusalem to the Vatican library, the document has carried the name of its discoverer. The manuscript includes at the end the oldest Slavonic calendar, these saints' days are recorded for the first time: Cyril (14th February), Methodius (6th April), Clement (27th July), Erazmus of Ohrid (2nd June) and the Fifteen Martyrs of Strumica (29th August). As for the Gospel of Mary it was first round on Mt. Athos (Sveta Gora) and the 137 psalms of the Psalter and the oldest Slavonic Prayer Book (Euchologion) were found in the ancient monastery St. Catherine on Mt. Sinai. Slavonic philologist are unanimous as far as the dating and the origin of these texts are concerned: the manuscripts are morphologically and lexically closely related, composed in Ohrid either at the end of the 10th century or the beginning of the 11th century and based on models dating from Clement's time. Recently scholarly discoveries have also added fourteen of the presumed five hundreds pages of the Codex retrieved from the library of Count Cloz (Glagolita Clozianus) to the Ohrid Glagolitic collection. Only four fragments from the Lenten Triodion, those for Passion week, have survived from Cloz's collection of sermont's of praise. The most interesting of these four is the second sermon, the Anonymous Homily, which has been proved to be a transcript of an original work by Methodius. This is supported by the similar, and sometimes even identical, terminology used in the Homily and the Zakon Sudni (Law of Judgment), the first Slavonic legal code, the backbone of Methodius Nomocanon. Time has preserved a small number of Glagolithic epigraphic monuments. On the southern pillar in the narthex of St. Naum's monastery, the only Glagolitihc in the four graffiti written one above the other is the signature "Nikula pop" (Nikula the priest). On the Krupiste site, in the Bregalnica region, letters and drawings engraved in unglazed clay and fired brick have been discovered. The titles, all 34 of them, were obviously incorporated into the slavonicised churches without a discernible significance. The letters, which originate from different cultures, also include Glagolitihc ones.